I first bought two of the Velvet Goth collection a couple of months ago, and have regretted not getting the rest ever since, so when Models Own had another 6 for £20 offer on I snapped up the remaining three shades. The first I chose to wear was Amethyst; this beautiful deep, jewel toned purple. Amethyst is a deep purple jelly with purple and silver glitter of different sizes. It dries to a matte finish and is opaque in two coats. 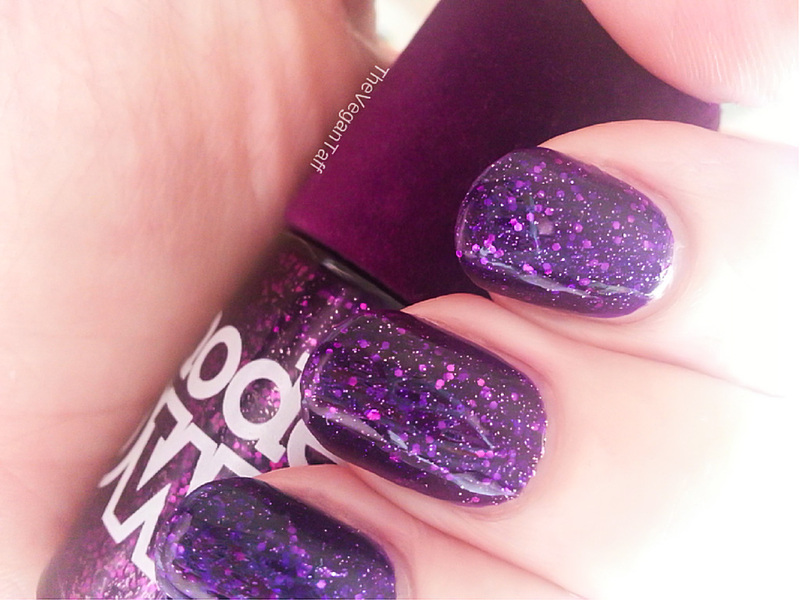 I absolutely love the shade and the glitter, and unusually for me I even really like the matte finish. So, now that I've told you the good, let me tell you the bad. The formula is horrible! The worst I've ever tried in any polish, regardless of price. It took me an hour and half to paint both hands with two coats, simply because it was so ridiculously gloopy and thick that I had to be super careful. It would drag and leave bald spots on top of my base coat and the edges of my nails looked awful; almost like I had cotton threads hanging off them. I've never experienced a polish like this before. It took a lot of work and time to clean up my nails enough for this photo. As much as I really enjoyed the matte finish I had to apply 2 coats of Seche Vite to even it all out, it just looked too bumpy without a top coat. Over all I'm really happy with the end result, but to be honest I don't know how often I'll reach for this because you shouldn't have to work that hard to get a nail polish to work for you. I'll be trying out the rest of the collection very soon and hope that they're not the same, with any luck I just got a bad bottle. I'm sorry I've had to write such a negative review, I don't enjoy doing so but refuse to sugar coat things for you, you deserve better than that. Have you tired this polish or any other from the collection? I'd love to hear your opinions in the comments. © The Vegan Taff | All rights reserved.